Let’s be honest, with its 275-section factory rear tires and 707-hp to play with, the Dodge Challenger SRT Hellcat was designed to do one thing: . There’s a reason one of the promotional shots of the latest SRT Challenger, the Demon, shows the muscle car choking on copious amounts of tire smoke. 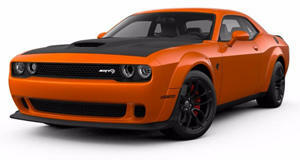 The Hellcat featured in this video posted by The Racing Channel doing what it does best is no ordinary model, however. As noted by The Racing Channel, the modified Hellcat delivers 1,000-wheel horsepower, so its actual crank horsepower output will be even higher. “Our friends at TR3 performance called us to film a quick burnout in their 1000whp Hellcat Challenger, needless to say they went a bit overboard!” The Racing Channel wrote. “This very well might be the most epic Hellcat burnout of all time." While you can probably find even more impressive burnouts if you scour through videos on YouTube, it’s hard to argue with that statement when it comes to seeing a Hellcat burn some serious rubber. Something tells us those tires are going to need replacing after that strenuous workout.